The Mary E. Kirwan Catholic Education Scholarship was established in 2014 in honor of the founder of our Scramble Golf Tournament and Scholarship Dinner, Mary E. Kirwan. A woman dedicated to Catholic education and the St. John the Baptist community, Mary has nurtured this from its infancy to the premier event it is today. A scholarship has been established that is awarded annually to a student who embodies the qualities consistent with Mary’s character—demonstrating leadership, faith, service, and the pursuit of excellence. 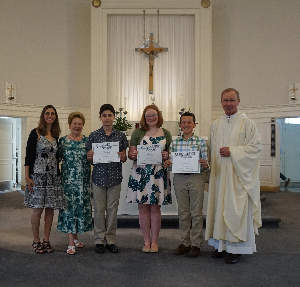 The Mary E. Kirwan Catholic Education Scholarship was awarded this year (June 2018) to three distinguished candidates: 7th grader Francesco Borgese, 6th graders Riley Stanton and Christopher DePinto. Each is the recipient of a $1,000 scholarship for emulating the qualities consistent with Mary Kirwan's legacy and character- leadership, faith, service, and a pursuit of excellence. Because of the tournament’s success, three scholarships were awarded. The candidates were nominated by the faculty, wrote an essay, and underwent an interview by the scholarship committee. These young ladies and gentleman distinguished themselves with their talents and deeds to be exceptionally deserving and worthy of this award. 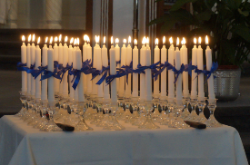 We invite you to contribute to the Mary E. Kirwan Catholic Education Scholarship. The Joseph and Joan Denzak Memorial Scholarship was established in 2014. Long-time parishioners Joseph and Joan Denzak sent their nine children to St. John’s School; some of their grandchildren are alums of the school, as well. Established by the pair’s nine children, they created this ongoing memorial to honor their parents and the sacrifices they made to ensure their children obtained a Catholic education. The scholarship was born on the premise that a Catholic education provides a strong foundation for morality, respect for others, and sense of altruism. The Denzak’s firmly believed that it’s important to use the advantages and gifts that God has given to a person not only for their own benefit, but for the benefit of others around you. To be a true Christian, one must have faith and do God’s work…with the two going hand-in-hand. Each year, a graduating eighth grader planning to attend a Catholic high school is awarded this scholarship. Ideally, the recipient comes from a larger family demonstrating some type of need. Moreover, the recipient should be an average student—someone who does not normally receive an academic award, but one who puts forth tremendous effort with his or her academics. The recipient of the scholarship is announced each year during the graduation commencement ceremony.